Raids by Indians were common in the early colonial settlements. The sons of William Penn were given the authority by the crown to handle the affairs of land holdings for these settlers. It is said that they angered the Indians when they met with and tricked them into an agreement that involved more land than the Indians intended to hand over. While the agreement was mutual, the intentions were not. These lands were given to the settlers by the Penn Family to start homesteads here in the Americas. The Indians sought vengeance by raiding these settlements to run the colonists away and regain the land. One of these homesteads belonged to the Sechler family. Early settlers bound together, often intermarrying and living with one another. Many times, it was common for them help each another tend the farms and gather for meals in one home. Such is the case with the Sechler home in North Hampton County, Pennsylvania. The Sechler colonial homestead, pictured to the left, was built sometime between 1740 and 1750 in the settlement of Lynn Township. A document that conveys ownership to a Sechler clan member was recorded in Northampton County, April 2, 1772. A warrant and patent of the property by Richard and Thomas Penn 7 years after the massacre (1764), conveyed ownership to a Federick Sechler, who owned the property until 1785. The exact location of the Sechler home was on a tract of farmland along present day Sechler Road, seven tenth of a mile from its juncture with the New Tripoli-Lynnville highway. The dwelling, nestled in the shadow of Schochary Ridge's northern slope, provided shelter and lodging for many German emigrant families throughout the years. The inside of the Sechler home had three rooms and an upstairs loft for extra sleeping quarters. This farmhouse sheltered these families in a harsh and, at times, an unforgiving wilderness. On July 9, 1757, as the families gathered for the noon day meal, the farm was raided by Indians. Within moments, ten people had been massacred and scalped. "These are to acquant you of a murder hapened this day at the houce of Adam Clauce, in said Township of Lynn, whaire three or fore nabors was cutting said man's corn: as they was eating theaire dinner, they waire fell one by a perty of saviges, Indians, and five of the Whits took to there heals, two men, two women, and one gerl, and got saf out of theire hands. Was killed and scalped, Martin Yager and his wife, and John Croushores wife and one child, and the wife of Abraham Secler was sculpt and is yet alive. But badly wounded, one sho thro the sid and the other in the thy, and two children kild belonging to said Croushere, and one to said Secler, and one belonging to Philip Antone not scullpt, and this was don at least three miles within the out side settlers, and 4 miles from John Everett's and Philip Antone's wife was one that took her tilit and came hom and acquainted her husband, and he came and acquanted me and I went emeditly to the place with seven men besides myself and saw the murder. But the IIndians was gon and I derectly purs'ed them about 4 miles and cam up with them in the thick groves weaire wee met with nine Indians, and one sprung behind a tree and took site at me and I run direct at him, and another one the sid flast at me, and then both took to there heals, and I shot one as i goge thro the body, as he fell on his face. But I loaded and after another that was leding a maire, and ye meane time he got up and run away and I fired on the other, and I think I shot him in ye Buttux, and my soldiers had oppertunity to shot three times, and then they got out of oure site in the thick groves, and wee cold not find them no more, but I got from them one maire and two saddels, one bridel and halter, and one bag with a cag of stil licker in it, and cloths and one brace cittel and four Indian Cake baked in the ashes of wheat meal and to aquat you further, that I have several new soldiers that has no guns, and were little powder and led, and I have sent this express to you hoping that you wold help me with arms and ammenishan, and so I remaine yours friend and humble servent. Jacob Wetherhold." "These are to acquaint you of a murder happened this day at the house of Adam Clauss, in said Township of Lynn, where three or four neighbors were cutting said man's corn: as they were eating their dinner, they were fell on by a party of savages, Indians, and five of the Whits took to there heals, two men, two women, and one girl, and got safe out of their hands. 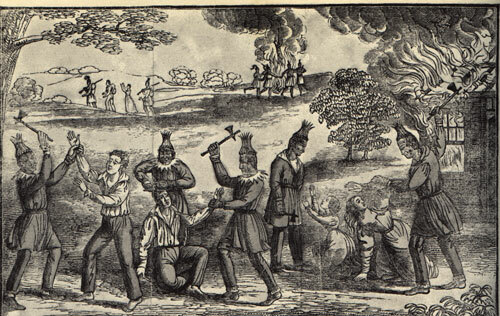 Was killed and scalped, Martin Yager and his wife, and John Croushores wife and one child, and the wife of Abraham Sechler was scalped and is yet alive, but badly wounded. One shot through the side and the other in the thigh, and two children killed belonging to said Croushere, and one to said Sechler, and one belonging to Philip Anthony not scalped, and this was done at least three miles within the out side settlers, and 4 miles from John Everett's and Philip Anthony's (Elizabeth Sechler) wife was one that took her tillt (unsure of the word intended here) and came home and acquainted her husband, and he came and acquainted me and I went immediately to the place with seven men besides myself and saw the murder. But the Indians were gone and I directly pursued them about 4 miles and cam up with them in the thick groves where we met with nine Indians, and one sprung behind a tree and took site at me and I run direct at him, and another on the side fast at me, and then both took to there heals, and I shot one as i got through the body, as he fell on his face. But I loaded and after another that was leading a mare, and ye mean time he got up and run away and I fired on the other, and I think I shot him in the buttocks, and my soldiers had opportunity to shoot three times, and then they got out of our site in the thick groves, and we cold not find them anymore, but I got from them one mare and two saddles, one bridle and halter, and one bag with a keg of still liquor in it, and cloths and one brace cittel and four Indian Cake baked in the ashes of wheat meal and to acquaint you further, that I have several new soldiers that have no guns, and were little powder and lead, and I have sent this express to you hoping that you wold help me with arms and ammunition, and so I remain your friend and humble servant. The Sechler and Anthony families both took great losses that day. These raids by the Indians were devastating to the colonies throughout our nation's early beginnings. Many immigrants were here to find a better life for their families; to find freedom, away from tyranny and religious persecution. Little did they know that road to freedom would come with such a high price. The Sechler home was abandoned for family use in 1919. The photo to the left is what remained in 1948 under the ownership of Charles Sittler. The house, as of 2012, was owned by Senator Miller. It is still very much a part of Lynn Township's history; a reminder of the early colonies and what the settlers braved while seeking a better life for their families. The Sechler family would see brighter days ahead to include many patriots who would shed their blood for our country's foundation and beginnings. The Anthony family mentioned in the Indian raid were also an important part of the Sechler family circle. Their families became very close and brought about several marriages between the two sides. Click on the links in the sub-menus of the "Sechler" tab to continue exploring their extraordinary family history.